Transmitting text messages from your cell phone is one thing, but imagine if you could retrieve text messages directly from the Internet? You could print them easily, as well as organize them in a logical way that will make it easier for you to find them later. Fortunately, this is in fact perfectly possible with any phone that has both Internet and texting capabilities. 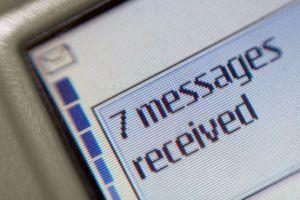 The primary way to receive SMS messages online entails utilizing a spy phone software. You must install such a suite on your phone and set up an online account. Afterward, the software will automatically forward every single text you receive to its online portal. Mobile Spy supports Android, Blackberry, iPhone, Symbian and Widows Mobile phones. In addition tracking SMS messages, it can also keep a log of your contacts, tasks, memos and e-mails. Keep in mind using it requires paying an on-going fee, as it's not available as a single, one-time purchase. Cell Control works on BlackBerry, Android, Palm OS, Symbian OS and Windows Mobile phones, as well as jail broken iPhones. It keeps track of all incoming/outgoing activity, and it allows you to review all said information through an online portal. There is a cost to purchase the software, but there is no monthly fee. The only way to receive text messages online with a non-smartphone is to email each text message that you want to be able to access later to yourself. Some carriers provide a free e-mail address for this very purpose. In case yours doesn't, you can still forward any text to a non-carrier e-mail address, but you may incur a data transfer charge in the process. Intercepting the text messages of an adult is an invasion of privacy that can be prosecuted at both the federal and state levels, depending on your country and state's particular laws. Such rules, however, don't apply to minors if you are their legal guardian. You may be questioning the value in retrieving a text message from the Internet in the first place. However, an examination of the following list should answer this question. Retrieving your messages online means you may then store them on your computer. This is particularly useful for retaining hold of messages that hold some sort of sentimental value to you. Online SMS reception permits concerned parents to intercept their children's text messages and then either approve or reject them based on their content. Replying to text messages through a computer keyboard can be much easier than using a non-smartphone keypad or even a smartphone QWERTY keypad. If your only intention is to track your own text messages through the Internet, then you have absolutely no reason to worry. If, however, you intend to invade the privacy of an employee, business partner, spouse or friend, think wisely before you proceed, lest you end up paying a penalty under the law.